On the left: a postcard, bought in Rome, November 2005. On the back of the photo, from the newspaper Osservatore Romano, the following description appears in Italian: “22 ottobre 1978. Il saluto di obbedienza del cardinale Joseph Ratzinger al neoeletto papa Giovanni Paolo II durante la messa di inizio pontificato”, meaning: Cardinal Ratzinger offering the newly elected pope John Paul II his greeting of obedience during the mass marking the beginning of the new pontificate. Sold in huge numbers to tourists and pilgrims in Rome, it almost seems to function as a contemporary holy card. On the homepage of Ats Italia Editrice it is classified as a “holy picture”. 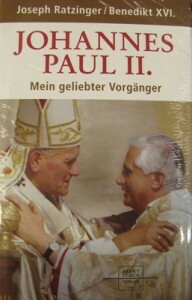 The appearance of this postcard after the election of Ratzinger as new pontiff on the 19th April 2005 is interesting as an example of a modern version of a traditional Christian iconography. If we think of the motif “Traditio legis”, Christ handing Peter the keys to the Kingdom and Paul a scroll, and the motif from Byzantine art with Peter and Paul embracing each other, this modern motif seems to combine the two. The Traditio legis motif conveys the message that the authority of the Church, represented by Peter and Paul, has been given to her by Christ himself. The embracing of the two apostles depicts the concept of ecclesial unity, the virtues and charismas of the Church complementing each other, forming a whole, an essential aspect of the Catholic: One Holy, Catholic and Apostolic Church. The postcard shows an event in 1978 which did not become of universal ecclesial importance until Benedict XVI succeeded John Paul II in 2005. Through the iconography of the postcard the hugely popular John Paul II seems to “transfer” his personal authority and charm to him who more than 26 years later would become his successor. As prefect of the Congregation for the doctrine of the faith, Ratzinger was (justly or not) known as a strict and conservative cardinal. 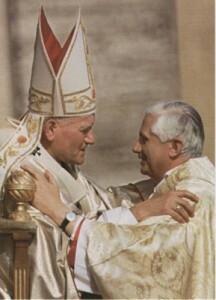 However, the embrace softens this image, the two smiling men united, sharing, so the photo suggests, a common view on the matters of the Church. Thus, the postcard reassures the Catholic world that the new pontificate is not totally different from the old one, but carries on in the tradition and spirit established by the long pontificate of the beloved John Paul II. What we see, having come to Rome and bought this postcard, is an important aspect of what in the purest sense of the word may be called an “apostolic succession”. It offers material for a devout reflection on this crucial phenomenon in the history of the Church. One may believe that this was definitely intended. Probably without intent, however, but open to a “pious exegesis” of the photo, the postcard might also describe the wider context of this succession. If you look closely, the brocade chasuble of cardinal Ratzinger carries the arms of the newly deceased pope, who had made him a cardinal in 1977, namely pope Paul VI. Thus, he is present. 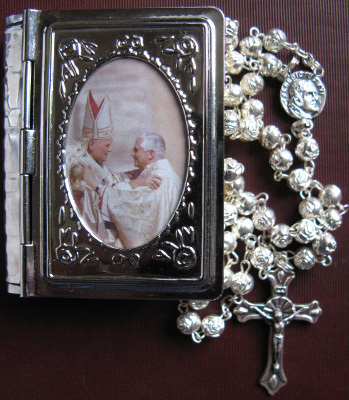 The photo shows John Paul II and the later Benedict XVI. But where is pope John Paul I? During his brief pontificate in 1978 he came to be known as “the smiling pope”. Hence, we may recognize his invisible presence in the smiles between his successor and the later Benedict XVI. In the middle the 2009 German book cover from Sankt Ulrich Verlag in Augsburg. On the right a rosary box, bought in Rome in August 2010. In the box a metal rosary with a tiny medal displaying Benedict XVI on the obverse and John Paul II on the reverse. Obviously, the cordial greeting between John Paul II and cardinal Ratzinger remains a very popular motif, as it continues to be of importance to emphasize the link between the two.